Join the Toyota High Mile Club and get a free sticker! Home > Ownership > Owners > Got a long-lasting Toyota? Join our High Mile Club and get a free sticker! Toyota is famed the world over for creating vehicles that embody incredible reliability, exceptional long-lasting quality and amazing durability. That’s why, following requests from Toyota owners, we’ve created a new way for people to show off how proud they are of their vehicle. The Toyota High Mile Club celebrates the Toyota models out there that have covered truly epic distances. 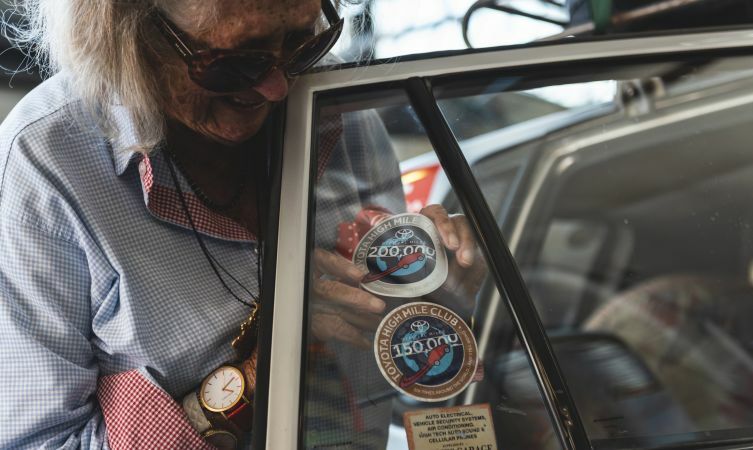 We’ve produced a limited number of exclusive interior window stickers so owners can celebrate their car’s stunning mileage, and Toyota reliability. If you have a Toyota of any age that has covered more than 150,000 miles, let us know by posting a picture of your car’s odometer with the hashtag #HighMileClub on our Facebook page or when mentioning @ToyotaGB on Twitter, and we’ll get in contact to post a sticker out to you. Three High Mile Club sticker designs are available – bronze-tinted for 150,000 miles, silver-tinted for 200,000 miles and a prestigious gold-tinted sticker for 300,000. Don’t forget, if we send you a sticker, we’d love to see you spread the word and share pictures of it on your pride and joy on your social networks. So, do you want to join our club? All you have to do is post a picture of your car’s odometer showing a mileage of more than 150,000 miles to the Toyota UK Facebook page, on Twitter mentioning @ToyotaGB, or on Instagram mentioning @ToyotaUK, using the hashtag #HighMileClub. We’ll get back to you in a private message / direct message to request your address details in order to send you a sticker. They’re nine centimetres in diameter – about the size of the old UK tax disc – and are removable. Toyota High Mile Club stickers will be allocated on a first come, first served basis. Please be aware that sticker numbers are limited and are available in the UK only, so we may not be able to fulfil every request, although we will do our best to do so. My 1999 T reg Yaris is still going and well looked after. The miles are 265401 so far. Please could I get a sticker. Thanks for getting in touch and congratulations on reaching 265k miles on your Yaris! We will contact you now via email regarding your sticker. Hi our 2005 Hilux 2.5 d4d has just reached 400,000. Please could we have a sticker. Still going strong only ever had a new battery and exhaust . Just run in . Thanks for getting in touch and congratulations on reaching such high mileage! If you could please send us a private message on one of our social channels, including a postal address, registration and image of your odometer, we will be able to assist you further. Thank you, if you could please send us a private message with your address, we will be able to send you a sticker. If you have sent us an image of your odometer along with a postal address to one of our social channels, then we can get a sticker sent out to you. Wonderful 1996 Hilux on 261198 kms. So, 163248 miles. I would love a bronze sticker, please, but only have email. No social media – a bit old, like my Hilux ! No welding ! Thanks for getting in touch. We will contact you via email regarding this, welcome to the High Mile Club! Thanks for getting in touch, it’s great to hear your positive comments and that you’ve reached such high mileage on your Avensis! If you’d like to receive 150k and 200k High Mile Club stickers, please contact us via one of our social media channels with a postal address and image of your odometer. Hi there, thanks for getting in touch. We have contacted you via email regarding this. We only send the stickers within the UK, so if you have any friends or family who live in the UK, we can send it to their address for you 🙂 Congratulations on reaching such high mileage! I have 181k on my ’07 Land Cruiser. But sadly don’t use any of those social media sites you mention. Can I email you a photo of my odometer for the sticker? Thanks for contacting us and congratulations on reaching 181k miles on your Land Cruiser! We will contact you now via email regarding your sticker. I have a Toyota Yaris which has just passed the 150 000 miles mark. It is still marching forwards!! I dont used the platforms as above. Could you contact me via email with regards to this High Mile Club sticker? Thanks for getting in touch and congratulations on reaching such high mileage! We will contact you via email now regarding your sticker. We have a Tacoma with over 400,000 miles. Is their a club for that?? Thanks for getting in touch. Congratulations on your many miles with your Tacoma, what an achievement! Unfortunately the High Mile Club is available in the UK only, however, we would recommend contacting your Toyota in your local region as they may have something similar. We wish you many more happy miles! Hi. I have a 1997 Carina e that’s pretty much pristine. Mileage just over the 150000. Could you contact me by email regarding getting a sticker as I don’t use any of the platform’s mentioned. Thanks for getting in touch and congratulations on reaching such high mileage! We will contact you via email now in regards to sending your sticker. Hi – have same problem as chap above, don’t do social media but wifes one owner from new Colorado has just passed 256,000 miles and still going strong, but she’d love a sticker! Thanks for getting in touch and it’s great to hear that you’re joining the High Mile Club! We will contact you via the email now to sort this for you. Hi, could you please contact me about getting a bronze sticker? Not on any of those platforms. Thanks for getting in touch. We have contacted you via email regarding your bronze sticker. My father in law has a hiace with well over 700k miles. Is there a record? Thanks for getting in touch. That is an impressive amount of miles! If you message us privately on one of our social channels with your address, we will be able to post a High Mile Club sticker. I would have hit 300000 miles today on my 06 Corolla. My odometer will not go over 299999! If you send us a picture to our social channels (we ask this of everyone for proof) and we will get a sticker to you. I have a 1999 Toyota corolla LE with 468,000 miles and it’s my daily driver.. is there a 500k sticker? Unfortunately we do not. Have you received all the other stickers? Hi, I have a mk4 hilux with over 160k on the clock bit dont have social media. Can I still get a sticker through this msg board? Cheers, hope you are still doing stickers when I reach 300k! Thanks for getting in touch. It’s great to hear that you’ve reached over 160k! We will contact you now via email in regards to sending you a sticker. No problem, just head over to our Facebook page and send us a photo of your dash with the miles on it and your sticker should be in the post soon. Here is the link to our Facebook page: https://www.facebook.com/toyotauk/. My cruiser is an EU model that’s had clocks changed. If I give an image of mileage from its yearly inspection would that be enough? Head over to our Facebook page and send us a picture and we will be able to send you a sticker. You can find it here: https://www.facebook.com/toyotauk/. Thank you for getting in touch. We’ll contact you using the email address that you provided when leaving the comment. Welcome to the elite High Mile Club! Thanks for getting in touch. Not too long to wait! Once you reach 150,000 miles be sure to send us a direct message on either Facebook or Twitter with a picture of your odometer and your UK address. Thanks. Thanks for getting in touch. Unfortunately this doesn’t apply to Lexus at the moment. This needs to expand to world wide as long as a owner wants to pay the shipping and for sticker. I would gladly pay for the sticker as well if this would occur. You have a great group of followers that would be more then happy to advertise for you and think it would be beneficial to open the door to USA especially. 1989 Toyota MR2 over 300k Miles. Congratulations for reaching this mile stone! We’ve taken your comments on board and will consider rolling this out world wide. Keep an eye on our blog and social media channels for the latest updates. How do I send a DM to give you my address please? Thanks for getting in touch, you’ll be able to find the Toyota Facebook page here: https://www.facebook.com/toyotauk/. If it’s easier, we could email you directly. Wheres my post gone…ii told you about my Colorado with 272,000 on the clock.. now its gone.. ran out of stickers have ya… ? All comments have to go through an approval process before being published. A member of our Social Media Team has contacted you directly. Thanks. Thanks for getting in touch and congratulations on reaching this milestone! A member of our Social Media team with email you directly to ask for further information. Thanks. Thanks for getting in touch. A member of our Social Media team will contact you directly for further information. Thanks. That’s great news to hear. Are you based in the UK? If so you’re eligible to join our elite High Mile Club. Thanks. Oh that’s a sham. We wish you many more happy miles to come. Thanks. Thanks for getting in touch. We’ve got your email address and a member of the Social Media Department will contact you as soon as possible. Many thanks. Congratulations Joy, that’s great news to hear. Have you received your bronze sticker? Thanks. Hi, I have a Toyota Land Cruiser HDJ81 with over 190.000 km. A real beast !!! Thanks for your lovely comments. Are you a part of our High Mile Club? Hi, I have a Toyota Sera with over 248,000km which is approox 155,000 mls. Congratulations on the milestone. Are you based in the UK? If so, post a picture of your car’s odometer with the hashtag #HighMileClub on our Facebook page or when mentioning @ToyotaGB on Twitter, and we’ll get in contact to post a sticker out to you. Three High Mile Club sticker designs are available – bronze-tinted for 150,000 miles, silver for 200,000 miles and gold for 300,000. That’s impressive. You’re eligible for 3 High Mile stickers! Can you direct message us on Facebook or Twitter with a picture of your odometer and your address? Just turned 500K on my Tacoma with the original 3.4. That’s great news to hear Michael. Are you based in the UK? If so you’re eligible to join our elite High Mile Club. Thanks. That’s very impressive. Let us know when you’ve hit 150,000 and we’ll get a sticker posted out to you! I have a 2006 Toyota Prius – the hybrid battery died at 96,000. We were never offered the Hybrid Health Check when the car underwent its service at an authorised dealer. Toyota GB would not replace the battery under warranty. Do you have a sticker for that!? We’re really sorry to hear that! Do you have a customer relations case number? That’s an extremely impressive mileage! Are you a UK resident? If you are, please DM us (Twitter or Facebook) a picture of your odometer and your address and we’ll get a sticker sent out to you! I have a 2000 camry ce with 527,000 km on it..still drive it daily.. If you DM us on Twitter or Facebook with your address, we will send a sticker out to you! Thanks for you post! That’s awesome. If you could DM us on Twitter or Facebook a picture of your mileage and your address, we can get some stickers sent out to you. Many thanks. Thanks for your post. If you could DM us on Facebook or Twitter with a picture of your mileage and your address we can get some stickers sent out to you! Many thanks. Hi, I have a 2006 Yaris with 293000 miles on the odometer. Am I entitled to a sticker? Thanks for your post. You are entitled to both a 150,000 sticker and a 220,000. We will send one out to you. Please message us on Facebook with a picture of your mileage and your postal address. Many thanks. I have a 2000 4Runner that is at 199,800 Miles. I will be posting a photo and address soon! Will you send me 2 stickers? Thanks for your post. We will send you the 150,000 miles sticker in the post for you once you have posted a picture and your address. Unfortunately, we are unable to post out the 200,000 sticker until you have reached this mileage. Hope this helps. Many thanks. Thank you for your post. Please could you provide us with a photo of your odometer and address to: toyota.contact@tgb.toyota.co.uk. Many thanks. Thank you for your post. Please could you send us a picture of your odometer and your address and we will be able to send out your stickers. Many thanks. I’ve done 162k in my prius but don’t use Facebook or Twitter…. Can you sort me out? Will this sticker not worsen the value of a vehicle? I.e. post a picture of a high mileage sticker with the car and you are sure to lose buyers. Mine has 123k miles. Pity there isn’t one for 120k. Thank you for your post. Great to hear you have completed 123,000 miles in your car and sorry we don’t have a sticker available for your current mileage. The thinking behind the sticker is all about longevity of Toyota cars, but thank you for your feedback. Thank you for your post. Please can you confirm your question? Many thanks. To bad about the UK thing, I have a BJ70 landcruiser that is approaching 600,000 kilometers.